Can anyone catch the Guyana Jaguars? The Jaguars opened up a 43-point lead at the top of the table with their fifth win of the campaign this time over the Leeward Islands Hurricanes as the West Indies Professional Cricket League (PCL). Even when the Jaguars were in trouble at 41/4 a rearguard unbeaten maiden hundred by wicketkeeper batsman Anthony Bramble (196) ensured that Guyana posted a sizeable first innings total of 417. Gudesh Motie who is known mostly for his bowling, featured in a 110-run last wicket partnership with Bramble scoring 47 to add to the 72 he scored two rounds earlier as nightwatchman. Slow left arm orthodox bowler Veerasammy Permaul spun a web with 6/32 as the Hurricanes were forced to follow-on bowled out for 149 in the first innings. In the second innings Leewards did just enough to make the Jaguars bat again finishing on 268 on the back of a century by Akeem Saunders (101). Permaul added two more scalps in the second innings a Guyana complete a ten-wicket victory. Outside of pole position the competition is on. Barbados Pride leapfrogged Trinidad and Tobago Red Force and the Jamaica Scorpions into second with a comprehensive victory over the Red Force. Shamar Brooks (96) and Jonathan Carter (72) led the Pride to 316 in the first innings with Imran Khan 4/81 and Daniel St. Clair 3/72 the most successful bowlers from the Trinbagonians. 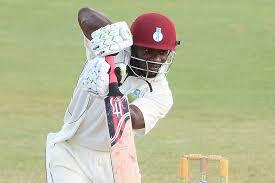 Only Denesh Ramdin with an unbeaten 132 offered any resistance as the Red Force could only manage 214. Jomal Warrican with 6/71 was the chief destroyer for Barbados. At 221/7 Pride were confident that they had scored enough to force a win with Youth World Cup winner Shamar Springer unbeaten on 51, Khan was again the leading wicket taker with 3/88. Like in the first innings Red Force succumbed to the triple spin attack of Warrican, Walsh and Williams, who all picked up three wickets each to bowled the Pride to a whopping 208-run triumph.